This army is waiting for a home for the holidays at my house. We'll deck the halls this weekend. (I didn't know when I posted this that the December 1st "theme day" for City Daily Photo was "waiting." See all the talented photographers and clever interpretations by clicking here. Cracking-good choice for the theme. lol at Brattcat! and I agree! Well, this post was just a coincidence that it fit the theme day. I didn't know the theme was "waiting," until I saw your comments. I encourage everyone to check out all the CDP posts on the theme. There are some fun ones! Yes, I have to lol @ Brattcat too. 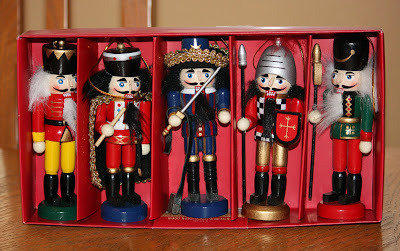 Excellent take on the theme (my nutcracker is already out!) Also loved yesterday's shot. Love the post, the image and the comments. A very funny choice for this theme day!